I'm back from my short Lenten hiatus and it surely was a good 3-day well spent organizing, getting artsy and creative as well as enjoying my life offline. How about you? I'm pretty sure a number of you are on your way back from an amazing vacation! Tell me about it below, okay? 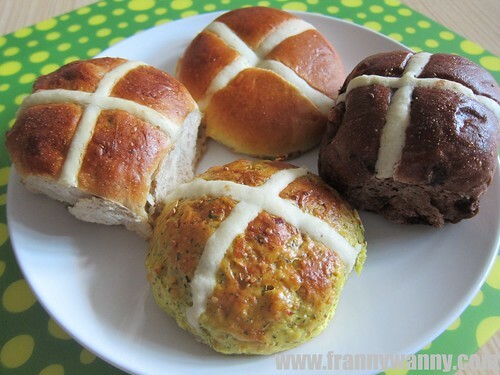 In some countries, it's a tradition to have a Hot Cross Bun during Good Friday. Well, it was my first time to see a real Hot Cross Bun up close and the moment I saw it, I got every single flavor there is in Cedele Bakery Cafe. We then had this at home for breakfast last Good Friday and it was fun doing a little taste-testing on which flavor is the best. Soft slightly spiced bun filled with raisins, cranberries and orange peel. I like the citrus notes that I get in every bite. The best way to enjoy this is to toast it till it's slightly crunchy outside and really soft and warm inside. Chocoholics will rejoice with this flavor. Each bite will give you a rich chocolate flavor with chunky walnuts mixed into the soft bun. O and Paul loved this flavor the most. Now this was MY favorite! 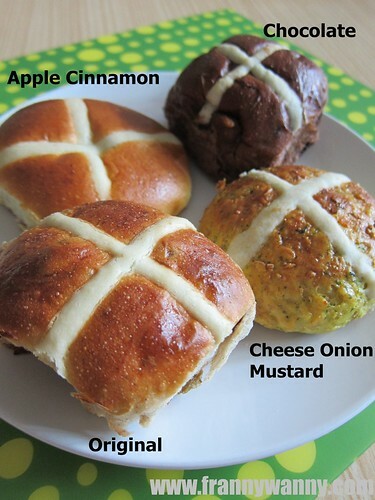 I really hope Cedele will offer this year round as I really fell in love with this savory flavored Hot Cross Bun. The bread texture is different from the regular Hot Cross Buns, this one was closely similar to a scone where it's chunkier and a bit crunchier too. It was so good as you can really taste the sweet onion flavor combined with a salty kick of cheese and a bit tangy after note from the mustard. It's amazing how can one bread bring such a good variety of flavors. Pillowy soft Brioche Bread filled with sweet apple cinnamon filling. It tasted very much like McDonald's Apple Pie's filling only I find it to be too thinly spread. I can taste more bread than the apple filling. Not bad but not something I'll get again. It's always a joy to try something new and this was indeed a GOOD Friday experience for me. Cedele Bakery Depot has a number of outlets all over Singapore and 2 branches in Hong Kong. Click here to see the full listing. what's the white cross in the middle? Hi Richard, It's basically just flour and water.